Use these forms to request a planned service. See the Event Equipment Request Form to request media equipment for an event. See the Printer Toner Request Form to request toner for a laser printer on campus. See the SharePoint Website Request Form to request a SharePoint website for a department or a division, a committee, or any kind of project workgroup. Enter the word "SharePoint" in the Purpose or Content fields on the form. See the Software Request for Classrooms Form to request that software be installed in a Computer Classroom or Lab. See the Student Website Space Form to request space on the student web server. Your students will be able to use their MCC accounts to FTP files to the server and view them over the web. 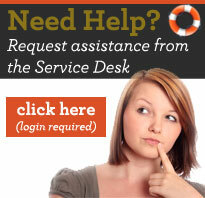 Request for New Phone Extension/Voicemail: To request a new telephone extension and/or voicemail account. Reassign Phone Extension: For reassigning a telephone number to another person. Request for Phantom Voicemail: To create a voice mail account for a user without a physical telephone. Auto-Attendant Request form: For multiple voice mail/announcement boxes on the same telephone extension. See the Technology Center-Technical Services Request Form to provision current employees with additional services or disable access to services no longer needed. This form must be filled out by Current Faculty or Staff and signed by their supervisors, then returned to the Technology Center Service Desk. See the Technical Services Request For New Employees Form to provision computer access for new employees. This form must be signed by the employee and supervisor and sent to the Technology Center Service Desk. See the Web Site Request Form to request a new web site shell be created in the OmniUpdate Content Management System, which is used to host all content on the College website.